To Build or To Renovate? - Questions about ECAC Hockey Identity. Could this be the other half of future home-and-home weekends? The main news that captured the attention of the ECAC Hockey community Thursday morning was the announcement from Colgate Athletics that 'Gate hoped to raise $37 million to construct a new ice hockey arena to replace Starr Rink. The Colgate community is expected to raise the $37 million through private donations without contribution from general University funds. The envisioned facility would be 97,000 square feet. The release neglects to mention if the $37 million would fund the creation of better training facilities, and mentions only locker rooms and showers explicitly. The situation should sound familiar to those who have been among the Lynah Faithful for more than about seven years. Cornell was at a similar juncture with Lynah Rink not too long ago. So, for the newer members of the Faithful or those who want to look back on the choices that our collective fanbase made, I thought it appropriate to analyze why in the great debate between building or renovating, we chose to renovate. I conclude with what I believe that choice reveals about the self-conceived identity of the ECAC. The conversations that occurred around 2004 about whether Cornell should renovate or build a hockey rink began and ended, as is the case with most things surrounding Cornell hockey, with tradition. The conversation began when historic rival and former ECAC foe Boston University began constructing Agganis Arena in 2003 that would serve to replace Walter Brown Arena. Brown Arena was the site of many famous BU-Cornell clashes and was where BU alumni Dave Silk, Jack O'Callahan, Mike Eruzione, and Jim Craig of the 1980 Team USA roster played during their tenures at BU. It was a keep-up-with-the-Joneses mentality that drove Cornell to consider building a new rink to replace historic Lynah Rink, but what the process triggered was delving into what mattered to Cornell hockey as an institution. Cornell considered what was needed for the program and what the fanbase wanted. Opinions of the Faithful, as is expected from a group infamous for its vociferousness, were not in short supply. 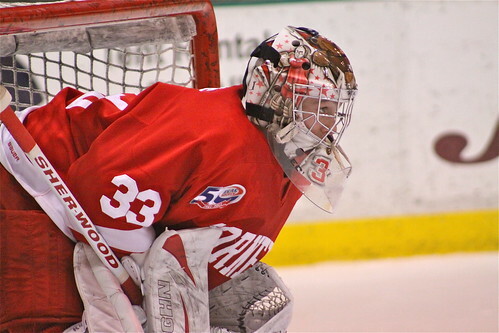 The renovate-or-rebuild debate focused upon how Cornell could gain the resources needed to compete with other large and historic NCAA Division I programs, and Canadian major junior programs for recruits. Was a new barn needed? The argument was not one-sided but the voices of the renovate crowd overwhelmed the few calling for a modernized facility that would forsake Lynah much like the Terriers men's ice hockey team forsook Brown Arena and began anew in Agganis. Many who favored renovation trusted Schafer's discretion. He was instrumental in giving Lynah its current feel and look. Fans who experienced Lynah Rink before the completion of renovations agree generally that the altered Lynah still maintained the hallowed confines of the historic arena and preserved the envirnoment that made Lynah Rink both loved and loathed. The renovations and modernizations that were envisioned and realized between 2004 and 2007 were revolutionary and respectful of tradition. A quick summary of the changes makes the renovation seem entirely transformative, but the essence of the Lynah experience that had developed since the first over-capacity crowd in 1962 remained the same. Lynah Rink before the renovations had standing-room only seating. The rink had concourses within the current walls that circumnavigated the U-shape of the inner arena within the current concourses outside of the arena proper. The end of the rink near Section A had no walkway or seating that traversed the gap between the southern and northern ends of the U. The renovations included the addition of the current atrium to Lynah Rink, the walkway with premium seating that bridges Section A to Section O, box seating that extended to the outer walls of the former arena, more seating benches, an external cooridor that serves now as the concourses, new locker rooms, study rooms, and enhanced training facilities. These new training facilites included the addition over the renovation period of the skating treadmill of CSTV fame, warm-up and cool-down facilities and tubs, and the fitness room that now looks out on Campus Road among others. Over the objections of some new locker rooms were added for both the men's and women's program that were at a level that required that the tunnel for the Big Red onto the ice requires the players to navigate a set of stairs. The desire to keep Lynah as much like its original incarnation while augmenting appeal to recruits and capacity resulted in the balance being struck between closing the final end of the U-shaped interior to make a complete bowl and leaving the interior arena as it was entirely. The compromise was the red walkway that holds several premium seats above the opposing goaltender. This allowed Lynah to look and feel remarkably similar to how it would have in its purely original form, but added signfiicant seating. The project to renovate Lynah Rink was funded entirely from private donations of alumni and fans. The University was reluctant to invest extensively in renovating Lynah Rink after it had invested $1.0 million within the decade to modernize elements of the Rink including the cooling system below the ice surface. The final total of the 2006 renovations amounted to $7.3 million. These alterations modernized the facilites, increased the competitiveness of Cornell hockey in attracting recruits, and added 464 additional seats. These great strides were achieved with a relatively modest amount of money compared to some investments made in the college hockey world recently. Rendering of the interior of Penn State's future Pegula Ice Arena. Penn State will join the ranks of NCAA Division I programs this Fall. It will play its first season at the NCAA Division I level in the previous home of its successful ACHA club hockey program. Penn State's Ice Pavilion holds 1,350. The facilites are unable to be modernized or expanded like Lynah was able. Furthermore, the historical incentives according to many, are far less than those that weighed upon the calculations of Cornell during its build-or-renovate debate. In many ways, Penn State is attempting to celebrate the history of its ACHA programs while still beginning anew. Pegula Ice Arena will be the new home of Penn State hockey beginning in the 2013-14 season. Pegula Ice Arena will contain state-of-the-art training facilities and two sheets of ice. The central arena will be a complete bowl that can seat 6,000. Terry and Kim Pegula alone donated the $102 million that will fund the construction of the Arena and transition of Penn State's programs to NCAA Division I. $88 million of that donation is to fund the construction of the building. Rendering of the exterior of RIT's future Polisseni Center. Rendering of the interior of RIT's future Polisseni Center. The Rochester Institute of Technology announced that it thinks that it has outgrown the confines of Ritter Arena and will seek to build an expanded hockey arena in the near future. Initial projections had the rink's completion in 2013-14, but with the slower pace in starting as compared to that of construction of the Pegula Ice Arena, many, including WAFT, think that the project should not be rushed and should be expected to be completed for the 2014-15 season. The RIT Tigers bursted onto the national hockey scene in 2010 with a Frozen Four appearance just five years after the program transitioned to NCAA Division I. Ritter Arena before and since this rise is filled beyond capacity commonly. The facilities at Ritter were not deisgned for long-term use and have begun to deteriorate to a level that needs repair. The Polisseni Foundation and B. Thomas Golisano donated a combined $4.5 million. This gift resulted in the naming of the future facility after Polisseni. The expected value of the facility that does not claim to nor shows in architectural renderings increased training facilities is $30 million. RIT expects to raise only half of that value from private donations with the Institute expected to contribute the remainder. The $30 million is what the expected cost of the arena proper without any additional training facilities to lure recruits. The renderings of the Polisseni Center are beautiful, but it leaves one wondering how much can an internal venue do, no matter how noteworthy, if there is not an associated proportional increase in a program's ability to develop its student-athletes in the athletic realm? Colgate seems bound to take the same tack as RIT and for less clear reasons. Future generations of 'Gate fans, students, and alumni should not be denied the experiences of Starr Rink. Current Michigan State head coach Tom Anastos emphasizes often that programs must put their rivalries or disagreements aside to do what is best for their conferences, their student-athletes, and college hockey. It is with this mindset that I will conclude with an appeal to 'Gate and its fans to reconsider its plans to replace Starr Rink with a $37-million facility. Putting the we-are-or-we-aren't-rivals banter between Cornell and Colgate aside, I would like to implore 'Gate students, fans, and alumni to demand that the administration that makes decisions that will affect them for generations consider heeding the lessons of Cornell's choice to renovate historic Lynah Rink rather than replace it. The choice to preserve Lynah Rink for future generations while making Cornell more competitive for college recruits struck the correct balance. The interior does not look identical to what it did with the original 1957 plan for Lynah Rink, but it is the same atmosphere. I knew as I sat behind Cornell's net late in the third period during the 2010 regular-season clash against Yale that would decide who earned the first seed in the 2010 ECAC Tournament that Scrivens occupied the same crease that Kennedy, Hayward, Eliot, LeNeveu, and Dryden had occupied during their times on East Hill. Last season, I took a friend from graduate school who is an alumnus of a university with its own respectable hockey tradition, Michigan, to watch the clash between Cornell and archrival Harvard. He spent the majority of the beginning of the game in awe that he was standing where just a few decades before members of the Lynah Faithful had stood to watch hockey legends Ken Dryden and Joe Nieuwendyk on the ice in Lynah. Andy Iles knows that he neither serves only in the same position as nor draws artistic inspiration for his helmet from Ken Dryden because for all intents and purposes he defends the same pipes. It is this continuity between the past and present that blurs lines and fosters a deep connection with history when one enters Lynah. Why would Colgate or its administrators elect to deprive its fans of the same sense of tradition and belonging? I know not Colgate hockey history well enough to draw the perfect analogies to their rich hockey history, but I know that as a program that alleges to have great reverence for its history that 'Gate fans, students, and alumni will find much that they desire to preserve in Starr Rink. Colgate hockey began in 1915. Colgate, much like Cornell and most members of the ECAC, has great respect for its heritage as one of the oldest programs in college hockey. Colgate's situation is more akin to Cornell's situation before renovations than the situations of either Penn State or RIT. Colgate has a longer history in its building than either program. Colgate has none of the size constraints that plague Penn State and RIT as they confront or anticipate crowds that are beyond capacity on a regular basis. Colgate University is a respectable liberal arts institution of 2,837 students. Part of its attractiveness and charm is in its size. However, its size must temper expectations that it can fill a rink much larger than Starr. The draw of fans, students, and alumni to Colgate hockey games is not so great that Starr cannot contain all those interested in watching 'Gate hockey comfortably. It is not a venue that faces sell-out crowds typically. Starr Rink has a capacity of 2,600. A university as rich with diversity as Colgate is cannot expect that it needs a hockey arena that is much larger than the one it has that can accommodate 92% of its student body because, as alien as it sounds to many reader, not all students are interested in college hockey. WAFT encourages Colgate to reinvest in its hockey programs, but it should not be at the expense of history. Starr is not beyond repair and its capacity is not too small for the crowds that it encounters typically. The University and 'Gate hockey community should invest in improving training facilities. It will be cheaper and at a lesser cost than the current plan. Colgate's proposal for an arena to replace Starr is notoriously lacking any provision that includes improvement in training facilities. Modernization of facilities through renovation should be celebrated. The fans of all ECAC teams should celebrate improving the facilities at Colgate because it increases the profile of the league and its attractiveness to recruits. However, the proposal released does not include such modernization and deprives our league of a part of its history. Our league is proud of the history of its programs as the oldest in college hockey. We should not allow one of our historic venues to disappear without question or criticism. Colgate's current proposal does little to improve its hockey program or increase its stature while sacrificing history, one of its most salient selling points. If Colgate can lure a player of such talent and character as Austin Smith to don the maroon sweater and play at Starr, should its administration truly be worried about its ability to attract top recruits to its barn? Our league prides itself on recruits of character and ethic. If a superficial new building will draw recruits instead of laudable history, do those recruits deserve to represent the institutions that are members of our proud league? I assert that the answer is no. Some fans from other programs or ECAC fanbases will use this opportunity to mock Starr Rink, the enivornment therein, or their experiences there. These comments might be acceptable or pithy in intraleague banter before contentious games, but I think they are ill-advised when the question before the 'Gate hockey community is one that strikes at the question of what is the indentity of the ECAC? Our history defines our league. Colgate hockey and Starr Rink is a crucial part of that collective history. Our league is home to seven of the ten most historic hockey barns. The ECAC is the only league with more than two representatives on such a list. Unsurprisingly, Starr Rink joins Meehan Auditorium, Hobey Baker Rink, Houston Field House, Appleton Arena, Ingalls Rink, and Lynah Rink on the list. The loss of such a venue would be costly to college hockey in general and 'Gate hockey in particular. It matters not what others think of Starr Rink or even what it looks like to loyal Colgate fans, students, and alumni. What matters is how the Colgate community, especially those members most invested in Colgate hockey culture, feels about historic Starr Rink and its ability to unite past, present, and future generations of the 'Gate community. I hope that Colgate will err on the side of preserving its history for the sakes of college hockey and the Colgate hockey community. I had the privilege of interacting with a family of four at the 2012 ECAC Championships in Atlantic City, NJ. The family was Colgate fans. I believe that both the mother and father were Colgate alumni who, judging by their comments and a hat that the father wore, attended their alma mater during the Raiders's first ECAC Championship and run to the national championship game in 1990. They had traveled down from Central New York to New Jersey with their children to watch their beloved Raiders play for another ECAC Championship. I could tell immediatly that love for Colgate hockey and Colgate University had transcended generation and emerged in the passions of both little boys. This made me look to the future when I hope to take my chlidren to Lynah Rink and tell them of the dazzling feats of not only Nieuwendyk and Dryden, but Gallagher, Greening, Scrivens, Whitney, D'Agostino, and Iles among many others who all put their skills on display in those hallowed walls. It is a privilege as a Cornellian and member of the Lynah Faithful to be able to share these memories and experiences across generations. It unites us all. This deep, personal, and passionate institutional history is what sets college hockey apart from most other sports. I am indebted to those who were vocal and in positions of authority who made the correct decision to preserve Lynah rather than replace it. As an alumnus and fan, I will ensure that if the history at Lynah is threatened, I act to preserve it as those before me had. I hope that leaders and members of the community at Colgate make the same choice in the near future so that generations of the family that I met in Atlantic City can share and make memories at Starr as I will do the same with my family at Lynah. Laing Kennedy and Ben Scrivens enjoyed essentially the same vantage point and atmosphere as a result of Cornell's decision.